Polyester 4"x 6" flags are attached to a 10" black plastic flag staff with a black spear top. World polyester flags by World Flags Direct. Show your country pride with this beautiful set of 20 high quality polyester flags, just $.75 per flag. Most orders ship same day if received by 3pm Eastern (Excluding weekends and holidays). Price includes 20 miniature desk flags. Less than $.75 per flag ! 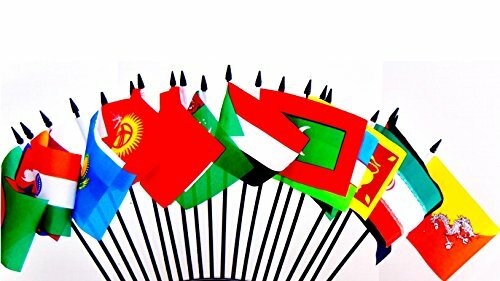 Afghani, Bangladeshi, Bhutanese, Indian, Iranian, Iraqi Jordanian, Maldivan, Nepalese, Omani, Pakistani, Qatari, Sri Lankan, Kazak, Kyrgyz, Syrian, Tajik or Tadzhik, Turkmen, Turkish and Uzbek or Uzbekistani flags included in this set.